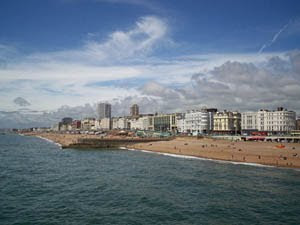 Police in Brighton are investigating a homophobic assault on a man in the Duke's Mound area by the seafront, after three men approached him as he was walking home at around 1.30 a.m. on Friday 27 August. The 51-year-old victim, a local, received a single kick to the side above his waist, causing him to fall and fracture his arm. Detective Constable Kelly Lewis said: "Our LGBT case worker is offering continued support to the victim while police investigate this isolated assault. We are liaising with the Terrence Higgins Trust, who will be speaking to service users, offering support and acting as a confidential point of contact at Duke's Mound and at their offices in Ship Street. "I'm keen to speak to a passer-by who stopped to help the victim to his feet and would urge anyone with information to report it." The attacker had a strong Irish accent and all three men are described as white, age 16-18, 5'7, slender build, wearing dark jeans and hoodies. They ran off in the direction of Brighton Marina.